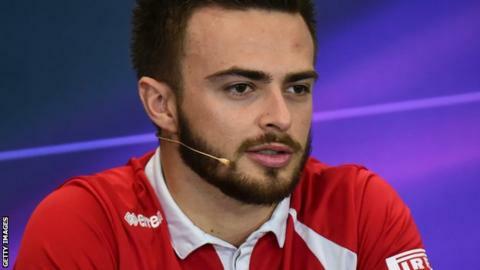 British driver Will Stevens has been dropped by Manor for the 2016 season and replaced by Indonesian Rio Haryanto. The 24-year-old has not scored a point after 18 grands prix starts. It means there will be three British drivers on the grid this year, with world champion Lewis Hamilton at Mercedes, Jenson Button at McLaren and Jolyon Palmer at Renault. The first race of the new season is in Australia on 20 March. Stevens secured the Manor drive last year through a sponsorship package believed to be about £6m. Haryanto, who is bringing in about £10m in sponsorship from Indonesia's state oil company, finished fourth in last year's GP2 series, winning three races. The 23-year-old said Manor had "produced a great package and I can't wait to get in the car". Manor's owner, Stephen Fitzpatrick, said: "He's tenacious on and off the track and made a big impression on last year's GP2 battle." DTM German Touring Car champion Pascal Wehrlein was named as Manor's other driver last week. Stevens made his Formula 1 debut with a one-off drive for the now-defunct Caterham team at the 2014 Abu Dhabi Grand Prix. Manor were well off the pace last year but the Englishman was able to finish 14 of the 17 races he started. His best result was 13th place at the British Grand Prix at Silverstone. Manor have struggled at the back of the grid since entering the sport in 2010 but have a new engine deal with Mercedes for 2016. Team founder John Booth and president Graeme Lowdon left at the end of last season with former McLaren sporting director Dave Ryan recruited as racing director.